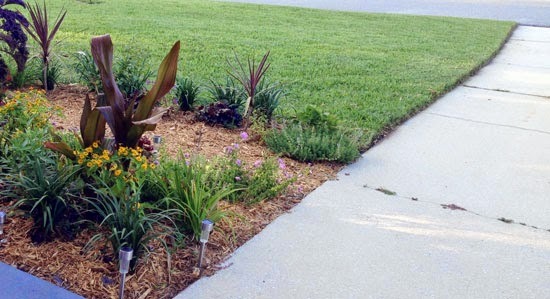 My idea of a perfect lawn is one that is kept neat and trim, and steadily becoming replaced by new garden beds. Lawn work should be fast, easy and even fun, and should never take time away from the garden or time with my family. Now that I have the TB6044 XP I was finally able to tackle what I thought was an impenetrable jungle of overgrown weeds and can now look forward to giving my lawn and garden beds a manicured look. Want to win one for yourself? Read on! "Wow! A string trimmer for only thirty bucks? How could this possibly be a bad idea?" I thought to myself late last summer as I emerged victorious from the home improvement store, smugly smiling at all the money that I saved with an electric Black & Decker string trimmer. Having purchased a house as a short sale, the lawn wasn't exactly a priority - even for this garden nut. It was the kind of house that one might compare to a stray dog brought home from a rescue shelter with the best of intentions, only to find out that it's flea-ridden, destroys your favorite shoes and requires an inordinate amount of expensive visits to the vet. Of course we loved the house, but not without swearing at it repeatedly along the way. By the time we moved in, stubborn weeds had taken over every nook and cranny of my lawn, sidewalks, patio and garden, and that affordable string trimmer was of little use. 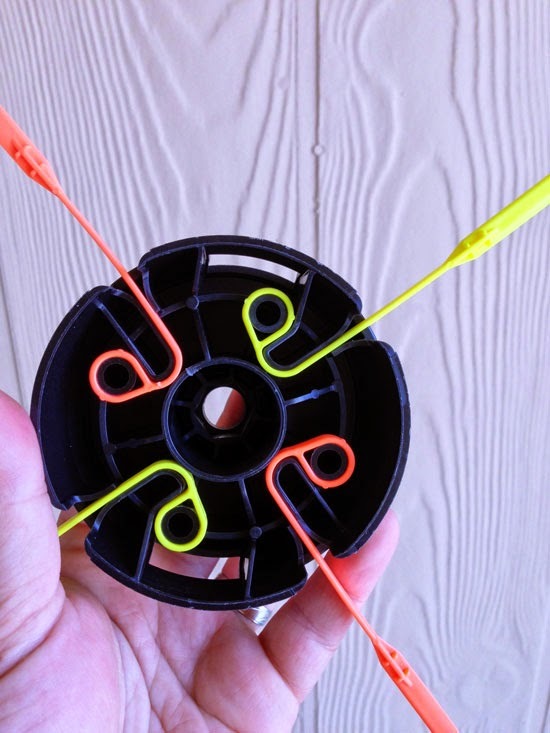 My affordably-priced 'Crap & Decker' string trimmer failed to trim all but the wimpiest weeds, required that I untangle and drag a cord all around the lawn and oh yeah - the bump-head didn't work properly and I had to manually take it apart and string more line through about ten times each session. Sometimes the electric motor would poop out on me, requiring that I take a thirty minute break to try again. I know that you get what you pay for, but after about three sessions of use I was ready to throw it in the trash because it made lawn work a terrible chore. The grass had grown over the driveway and was too thick for my other trimmer. Now it looks great! So you can imagine my elation when the UPS driver unceremoniously dumped the answer to all of my prayers on my doorstep: A 4-Cycle Troy-Bilt XP string trimmer complete with an Aero-Flex attachment and pole-saw attachment. 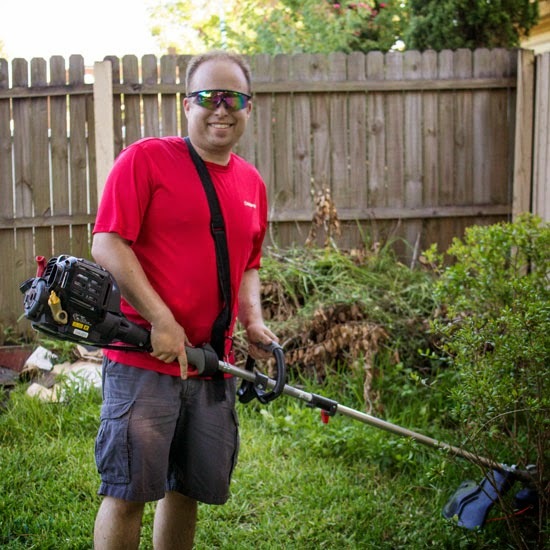 As a Saturday6 blogger I have the privilege of testing Troy-Bilt products like the Cultivator and Neighborhood Rider mower that I tested last year, but this time around all I wanted to get my hands on was a decent string trimmer that actually worked. I got a lot more than I bargained for. My pole saw attachment turned an overgrown viburnum into a log edging! What I love most about this string trimmer and all others in Troy-Bilt's current lineup is that they were made to work with a range of attachments. 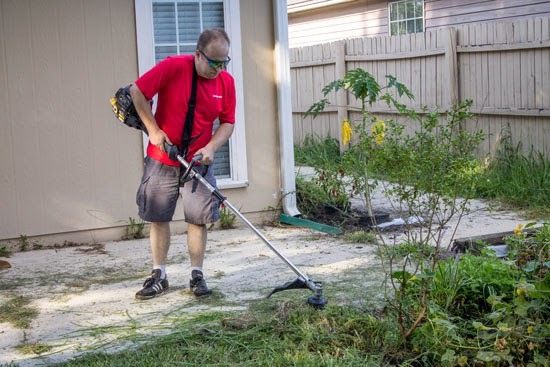 $59-$99 is all it takes for the owner of a Troy-Bilt string trimmer to turn it into an edger, leaf blower, cultivator, hedge trimmer, brush cutter, sweeper, pole saw or stringless trimmer. This means that rather than devoting an entire shed or garage to separate power tools, there's only one base unit to refuel and service and the attachments can easily be stored on the wall from hooks. The unit shipped with a pole saw attachment, so I set aside an evening to try it out on the viburnum trees out front. 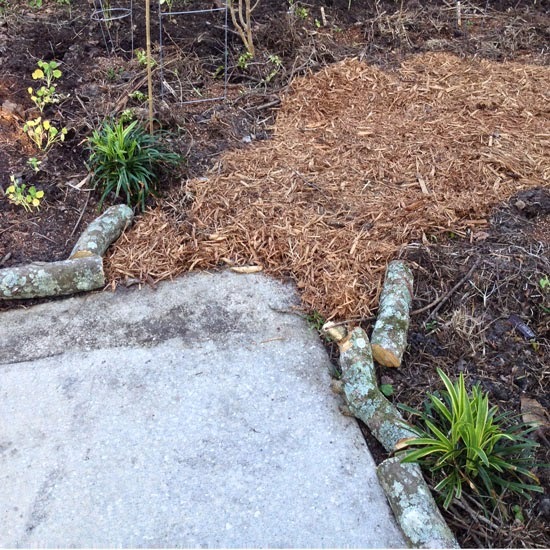 Before I knew it I was finished and looking for other limbs to cut down, so I cut the viburnum trunks into short lengths to be used as an edging in the vegetable garden. After 15-30 minutes I was able to swap out the pole saw attachment with the trimmer head, hang the pole saw on the garage wall and go inside to make dinner. 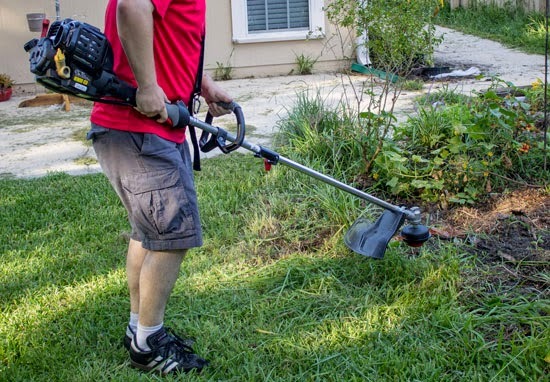 While this is a string trimmer review, it's worth pointing out that the pole saw was much easier to use than the one that I had borrowed from a relative earlier this year. Because I had had it up to here with bump head string trimmers, I was overjoyed to get an Aero-Flex stringless trimmer attachment along with the trimmer. I loved how quickly I was able to load the plastic blades into the trimmer head, but became a little concerned after reading some reviews stating that the blades break easily and decided to take it for a spin in the roughest parts of my yard - that is, the areas better suited for the edger or brushcutter attachments. I let the neon blades loose in knee-high weeds, in bushes, along weed-filled cracks in the driveway, against metal road sign posts, in pile of branches... you name it. Yes, the brutal treatment did wear down on the blades after a while, but they did not break until they were almost entirely worn down to nubs. I replaced the worn blades and used it to edge my garden beds, driveway, sidewalk and streetfront, as well as regular trimming where my mower wouldn't reach. This session of regular usage left the blades with little wear at all. The installed Click N Feed system allows you to feed new trimmer line without taking apart the case, which is a big deal to someone like me who is used to spending more time with the trimmer line than actually trimming grass. As much as I love the Aero-Flex option, I like ripping into weed-clogged cracks in the sidewalk and shrubby growth without having to worry about breaking the blades. The only problem is that it's like a loose cannon and can destroy my garden plants with the same gleeful enthusiasm that it has while destroying the bad guys. At the time of writing, the TB6044 XP comes with a bonus Aero-Flex trimmer head, meaning that you can decide which style works best for you, but I highly recommend buying the whole Aero-Flex attachment so that you can easily switch off between the two styles to suit your needs. The Click N Feed head is a beast capable of decapitating some of my bushes and other plants (not to mention tearing off chunks of our old fence), so I prefer to use it where brute force is more important than precision. It's also best for trimming around metal signposts and utility boxes since breakage isn't an issue. The Aero-Flex is the one I'll use more often because the blades are easy to see and stay at the same length and position. I prefer using the Aero-Flex for decorative trimming around plants, edging the driveway and trimming around fences. While compatible with the Jumpstart, (sold separately) it starts easily with one to three pulls. 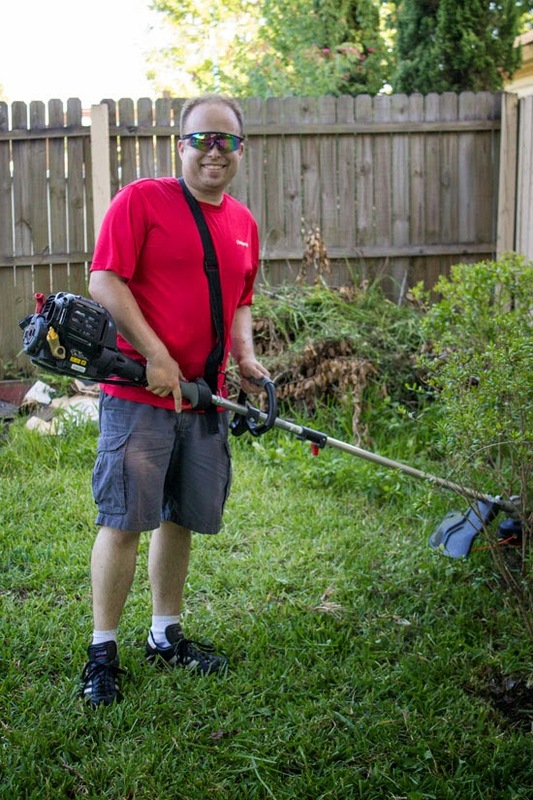 There are two ways to start a Troy-Bilt String Trimmer, and both are easy-peasy. Last year I was thrilled to try out the Jumpstart, a device much like a power screwdriver that can be used to start mowers, cultivators, tillers, string trimmers and the like. 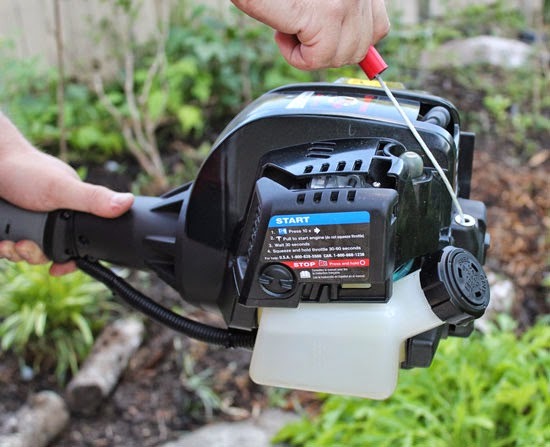 I used it the first few times I used my string trimmer but got tired of going back to the garage or looking around for it between uses and much to my surprise, it was just as easy to start the trimmer without it. After pressing the primer button ten times as directed, I don the trimmer via its carrying strap, grab the cord and let 'er rip. It's started up the first time almost every time, leaving me to wonder what the heck I'll do with the Jumpstart. I'm sure it's useful for devices that don't start easily, but clearly the trimmer starts up like a charm. This thing's weight and size made it a bit cumbersome at first, but only until I started using the included strap and set the handle higher. Once I had it set to the right height, trimming was a breeze. I've read a few complaints about noise or vibration online, but it still seems a lot quieter than the ones I've heard neighbors and landscape crews use. It did vibrate, but not enough to be uncomfortable. Unlike other string trimmers I've used, the large padded handle allowed me to trim for long periods without fatigue or blistered hands. There weren't many things I would change about the TB6044, and the following complaints are nothing more than minor annoyances. Oil leaks through the vents unless the trimmer is lying flat on the ground, but my mother-in-law was nice enough to install horizontal bike hooks in the garage while I wasn't looking, so storage is quick and easy. Changing out the attachments and their positions is easy if you only do it once or twice during a session, but pressing the spring-loaded metal button into the hole can hurt your fingers after a while. This can be a pain since when I'm using the trimmer in the edging position I have to change it back to the trimmer position to bump the head and release more line. Again, these are just minor annoyances. Believe it or not, the TB6044 XP actually makes yardwork enjoyable even in the middle of a Florida summer. I'm serious. Starting it is simple whether you use the Jumpstart or the cord, and I don't have to mix fuel and oil. When in use, it's five times faster than my old string trimmer thanks to the powerful 4-cycle engine. It's tough to get much time outside with a newborn around, but between my Neighborhood Rider mower and my trimmer I can mow, trim and edge my front yard in about thirty minutes. When you're a new dad, every minute saved is priceless. I haven't used any comparably priced trimmers and can't vouch for them, but the point is that I don't see the need for anything better. I also don't have to worry about winding and loading trimmer line; whether I use the Aero-Flex attachment or the included Click N Trim Trimmer head. Getting my weedy back yard under control seemed impossible before, but since I can attack the most overgrown weeds without hesitation now, I actually look forward to yard work. What more could you possibly ask for? To win a TB6044 XP string trimmer (MSRP $239.99) for yourself, just leave a comment telling me which of its features you'd enjoy the most in your garden, along with a way to contact you if you win. I'll randomly pick a winner on Monday, July 7th! Oh, and to win you must be a legal resident of the United States. I'd love to use the click and feed feature to trim all the underbrush we have in the woods around our gardens!! I like that it has a strap and is not to hard to use usually they are so difficult to move for me but I believe this may just fit perfectly for me to be able to help my husband a little. Good to see you wearing glasses/eye protection when using the trimmer. Our old trimmer is ready to be replaced. I llove that it has a strap, those things get heavy after a while, especially for us smaller people. Thanks for the giveaway! I like the blades instead of strings. I like that it is quieter than a lot of others! What I would like most about this is that we don't have a trimmer (or many tools at all, since this is our first year with a yard) and it would really help my husband out. I love how this has assorted attachments to buy, which for us would be a lot more efficient in terms of money and space than buying a bunch of individual tools. Awesome trimmer! I like the Aero-Flex attachment. I like the 4-cycle engine so it can work so much quicker.